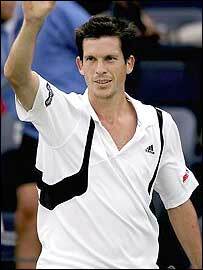 Tim Henman finally saw off Dominik Hrbaty 6-1 7-5 5-7 6-2 to reach the semi-finals of the US Open on Thursday. Rain had suspended their quarter-final on Wednesday with the Briton two sets up but trailing 4-5 in the third. And on a windy Grandstand Court, Henman made a slow start, dropping his second service game as Hrbaty took the set. But Henman recovered his composure with two breaks in the fourth and held on to set up a semi-final against Roger Federer, who beat Andre Agassi. The victory takes Henman into the last four at Flushing Meadows for the first time, and follows a debut appearance in the French Open semis in June and a run to the last eight at Wimbledon in July. Henman will now get his first taste of "Super Saturday" - the unique scheduling at the US Open that sees the men's semis played either side of the women's final, with their own final just 24 hours later. "Its awesome, it's a big weekend of tennis," said Henman. "I've had a great event and I want to keep going." Having led Hrbaty by two sets and a break, Henman had already let a chance to wrap up the match slip on Wednesday before the rain came. And when he played a poor service game to hand the third set to Hrbaty on the resumption of the match, the prospect of a comeback from the Slovakian loomed large. However, the British number one insisted afterwards that he had been prepared to go into a fourth set. "I thought if I lost the third set I'm still up two sets to one and in a great position," he said. "I got off to a strong start in the fourth and tried to keep the points as short as possible. "I thought I'd come in on everything and see if he can pass me; that's tough to do." Breaks in the first and fifth games finally gave Henman the cushion he needed and, with the help of a much-improved second serve, he closed out the match to set up a mouthwatering semi-final.